Fellow Champagne author Graeme Brown is visiting on my blog today. Graeme, thanks for agreeing to do an interview for me. 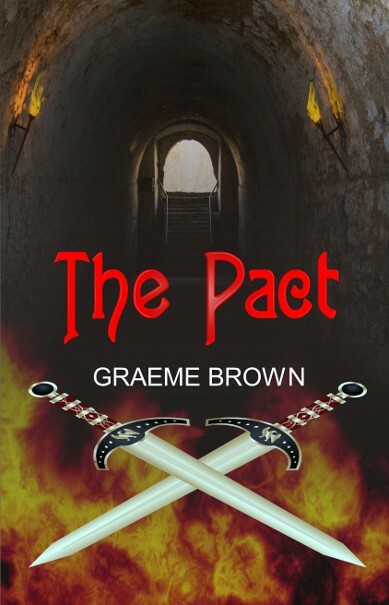 Graeme is the author of The Pact, a debut short story (fantasy). Enter the world of Will Lesterall, a boy who’s grown up in the safety of his father’s castle. Tales of the outside world ruled by warring kings and creatures of nightmare have never seemed a threat, yet on the night celebrating the two hundredth year of the sacred Pact that has kept Fort Lesterall safe, a secret intrigue ripens, and in the course of a few hours Will is confronted with a choice greater than he can comprehend. Join an unlikely hero as destiny pulls him into the middle of an ancient conflict between fallen gods and ambitious women, one that demands blood, both holy and wicked, and the power of an ancient fire bound in steel. As swords clash below a watching wood, hope and betrayal war as fiercely as fear and valour. Whether he lives of dies, Will Lesterall will never be the same. I understand The Pact is the beginning of a much larger work. Please tell us about your other works in process? I have been working on a novel for the last fourteen months. It is called A Thousand Roads. Originally meant to be a sequel novella to The Pact, it quickly turned into a novel around 140,000 words. I finished “writing” it in September, but, since this will be my debut title, I am spending longer on this project to go through all the story-building strategies I developed to make sure everything works out. Being epic fantasy it is extremely complex, which makes revision quite challenging, because I have about ten layers to attend to in some places, but I have my fingers crossed that in a few months I should have everything just so. Anyone who enjoys a good adventure into a unique fantasy world. I have spent the last twenty years developing the settings, mythologies, stories and even languages for the world my stories are set in. If you read Lord of the Rings, Wheel of Time, or (the ongoing) Song of Ice and Fire and love an epic arc of tales that promises to take you bodily to a rich, magical world, then I think you might enjoy what awaits in the pages of my stories. Tolkien acquainted me with a love for creating worlds. J.K. Rowling’s work helped me to break out of the “ye-olde-fantasy” forms and think about a more contemporary audience – she showed me how to make imaginative stories fun. Robert Jordan’s rich Wheel of Time series gave me a long pause and incentive to finally bring my stories to life. Finally, George R. R. Martin gave me an appreciation for voice that made me finally stop writing a story and instead start telling it. When I was twelve, I opened up a book called The Dark Tide, by Dennis L. McKiernan. From that point forward, I could not stop thinking about fantasy worlds and began making up my own while delivering newspapers in the morning. I read Lord of the Rings when I was thirteen and the passion grew deeper. It continued to grow through various life experiences and encounters with other great fantasy worlds – namely, the ones left behind by authors like Robert Jordan, Terry Goodkind, J.K. Rowling, George R. R. Martin, Tad Williams, and Terry Brooks. Now that I’ve begun to write in my own world, I can’t get enough. The only thing that holds me back is the time I spend paying the bills. Scotland! I love it there, having lived there for 2 years when I was fresh out of university. I would go somewhere in the Highlands, maybe near Fort William. I’d hire a car and drive around Ben Nevis, and maybe circle the Isle of Skye again – where sheep outnumber people 3:1. If you were recognized by posterity for only one thing, what would you wish to be known for? My stories. The more I write, the more I want to pour more time into this large task of bringing the stories to life. When all is said and done, I want to leave behind something beautiful that people will enjoy – a testimony that the world of imagination is a wonderful place, a heaven beyond that can live in the here and now. If you could have lived during one period of time in the past when and where would it be? Use the money to write full time, which would include hiring an assistant, a web-design and marketing team, and getting a writing studio that gives me space to spread out my maps and world notes that are getting too fat to fit in my their black box. Although the fantasy stories I write are quite dark, my intention with them is to reveal a world that is rich and beautiful, despite the many terrible things that sometimes infuse it. Eventually, the story arc will lead me into a world of light, but meanwhile I’m prepared to be mistakenly labeled a “lover of the dark and gritty”. Thanks so much for having me as your guest today, Ceci! You are so very welcome. As many of my followers are friends who primarily read genres other than romance, I thought they might enjoy meeting you. As of today, a little Christmas Goblin stopped by and told me there are 30 free copies of The Pact to give away – do stop by my blog if you’d like to get one of them.